The Pannonian Plain or Basin including the Great Plain of Hungary is a large feature in central and Eastern Europe that had been an inland sea in prehistoric times(b). 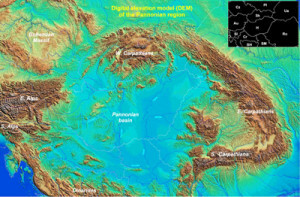 A paper was submitted to the 2008 Atlantis Conference in Athens by three Romanian researchers, M. Ticleanu, P. Constanin and R. Nicolescu proposing this region as the original location of Atlantis. This paper, together with a large number of maps, is now available on the internet(a). 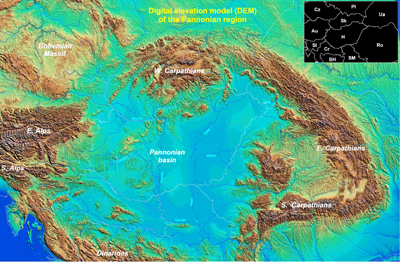 The Pannonian theory should be studied in conjunction with the substantial work of Nicolae Densusianu who proposed in 1913 that the Pillars of Heracles had been situated on the Danube, as well as the more recent views of Ranko Jakovljevic who also proposes a Danubian solution to the Atlantis mystery.